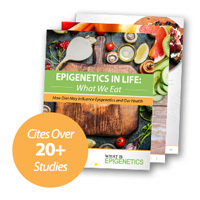 Ginger’s Potent Epigenetic Health Benefits | What is Epigenetics? Ginger root, or the rhizome of the flowering ginger plant (Zingiber officinale), has been cultivated for millennia for use as both a spice added to food as well as a tonic used to cure ailments. Though originating in southeast Asia, ginger was used extensively by the Romans up until the fall of the Roman Empire where it then began being more widely traded and slowly crept into homes around the world. Now, the field of epigenetics is delving into the health benefits of this widespread rhizome. While ginger has a high water content and almost negligible nutritional value because of the small doses in which it is typically received, recent studies and epigenetic research have shown its efficacy in aiding everything from indigestion to inflammation and muscle pain. By affecting the way thousands of genes express themselves at a time, the molecular components of the ginger root are enhancing the health of the human body in ways researchers are just now discovering. Ginger is considered a powerful herb with the ability to impact chromatin in a cell’s nucleus and regulate epigenetic mechanisms, particularly histone acetylation. Where acetylation is the process by which an acetyl group is transferred from one molecule to another, ginger – and similar herbs like turmeric, tulsi, and cinnamon – are proving to exert influence on gene regulation. In one study, researchers from Howard University found that ginger was able to increase histone H3 acetylation and suppress the expression of histone deacetylase 1 (HDAC1). 1 Histone acetylation removes the positive charge of histones and ultimately relaxes the structure of tightknit chromatin, leading to increased transcription – the first step in gene expression where a particular strand of DNA is copied into RNA. The enzymes which remove an acetyl mark are known as HDACs. When an individual consumes health foods like ginger, these epigenetic tags attached to histone proteins around which the DNA is wrapped can be adjusted, influencing the expression of genes linked to inflammatory and neuroprotective pathways. Potent, aromatic, and spicy, ginger’s primary bioactive ingredient is gingerol, which research has shown serves as both an anti-inflammatory as well as a cancer-fighting antioxidant. 2 Its ability to quell feelings of nausea and indigestion, from morning sickness to seasickness to nausea associated with chemotherapy treatments, has also been illustrated in recent studies. 3 Gingerol and the additional compound shogaol, found only in dried or cooked ginger root, are quickly absorbed by the body and both increase gastric tone and motility as well as relax intestinal muscles to release built up pockets of gas. When it comes to preventing cancer, a 2012 study 4 illustrated ginger’s remarkable anticancer activity in inhibiting growth and production of prostate cancer cells. Specifically, the researchers found that administration of whole ginger extract significantly reduced tumor volume. Importantly, they even found that whole ginger extract did not exert any detectable toxicity in normal tissues. Ginger can be prepared and consumed a variety of ways. Slivers of the root can be added to hot water to make a ginger tea, or the root can be grated into a “ginger shot” with lemon or orange juice and a pinch of turmeric. In addition to eating a balanced diet and getting regular exercise, taking a ginger shot for weight loss can be effective as gingers’ digestive and thermogenic properties have been shown to promote a healthy metabolism and gut function. Furthermore, research on the connection between ginger root and Type 2 diabetes 5 revealed that regular use of a ground ginger supplement (2g/daily) for 12 weeks resulted in a significant reduction in fasting blood sugar in adults. Ginger can be found in crystallized, candied, powdered, ground, pickled, dried and preserved forms, and is available in most grocery stores. While tea or ginger shots might be hard to swallow for some, minced ginger root can be added to foods like curries, soups, and sauces, often of Asian or Caribbean influence. The incredible ginger root boasts flavor and a surprising amount of health benefits, including epigenetic anti-cancer and anti-inflammatory effects. Its accessibility and rather inexpensiveness makes it a possible non-medicinal alternative for numerous ailments. Many have used it for relieving muscle pain after exercising, reducing menstrual pain, and fighting joint inflammation and stiffness. Additional research will tease out the precise epigenetic mechanisms that are at play when we eat ginger, but making this ingredient a kitchen staple in your home has the potential to improve your health in many ways.